While most of the major new players in Star Wars: The Force Awakens got a decent amount of screen time, one individual can’t count herself among that bunch. As the first female villain to appear in a Star Wars movie, there was a lot of hype surrounding Captain Phasma, played by Game of Thrones’ Gwendoline Christie. However, as those who have seen the movie can attest, she wasn’t given a lot to do over the two hour story compared to other baddies like Kylo Ren and General Hux. Fortunately, when Star Wars: Episode VIII rolls around in two years, she’ll be have a more prominent role. She's an important character, a baddie in the best sense of the word. Warning: spoilers for Star Wars: The Force Awakens are ahead! 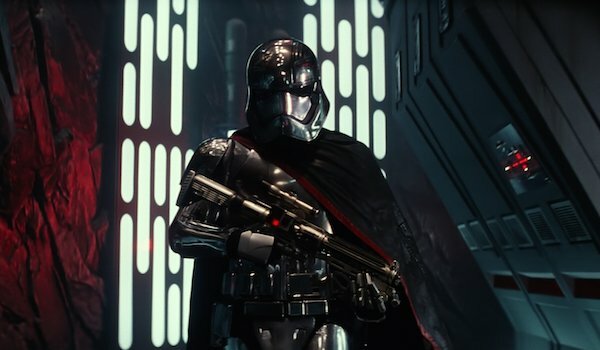 Captain Phasma was introduced in Star Wars: The Force Awakens as the captain of the First Order stormtroopers, with her distinctive silver armor setting her apart from her subordinates. She was first seen supervising the massacre of the Jakku village. Noticing Finn’s reaction to the atrocity, she ordered him to turn in his blaster and meet with her later, prompting him to break Poe Dameron out of custody and hightail it out of that Star Destroyer. Following a meeting with Kylo Ren and General Hux about how Finn failed to report back for re-conditioning, Phasma wasn’t seen again until she was forced by Finn, Han Solo and Chewbacca to lower Starkiller Base’s shields for the Resistance assault. While they didn’t show her getting off the weaponized planet before it exploded, the confirmation of her Episode VIII involvement tells us she made it off in time and will be back to cause trouble in an expanded capacity. Aside from completely dedicating herself to the First Order, we don’t learn anything personal about Captain Phasma, making the comparisons to Boba Fett in the Original Trilogy more apt. Whether or not they pull back the curtain on her background or keep her an enigmatic figure, there are plenty of directions for her to go in the next movie, be it continuing to serve the First Order or separating from them to hunt down Finn (the only stormtrooper to ever defy her) personally. At minimum, we can expect her to be deeper in the action when the trilogy resumes, which means she’ll hopefully get to actually fire her blaster or fight one of the main characters. We’ll see Captain Phasma back in action when Star Wars: Episode VIII hits theaters on May 26, 2017.